VIN number decoder breakdown in full detail. 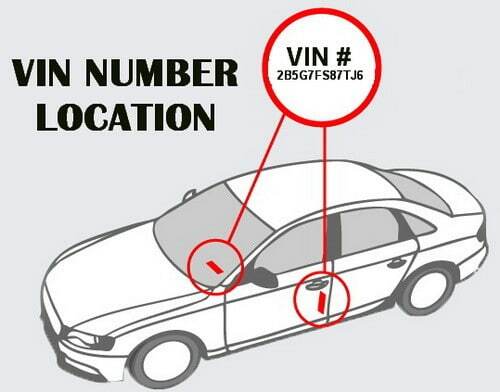 The below information will explain how to decode your VIN (Vehicle Identification Number) number. A VIN number consists of 17 positions. Basically the digits can be broken into 3 groups. Those 3 groups are… World Manufacturer Identifier (WMI), Vehicle Descriptor Section (VDS), and Vehicle Identifier Section (VIS). Note: VIN Numbers do not include the letters I (i), O (o), Q (q), U (u) or Z (z), or the number 0, so they will not be confused with similar looking numbers and letters. The first three positions in a VIN number show the World Manufacturer Identifier. The first position (number or letter) identifies what country the vehicle was made. The second position (number or letter) identifies the company who made the car. The third position (number or letter) identifies the vehicle’s type or manufacturing division. Positions 4 through 9 identify the Vehicle Descriptor Section. The fourth, fifth, sixth, seventh, and eighth positions (number or letter) identify certain specifics. The ninth position is used to see if the VIN is invalid. The Department of Transportation developed this based on a mathematical formula. VIS gives you info such as when the vehicle was produced and the specific options or optional equipment that was added. These numbers or letters will vary depending on your car or truck. The tenth position (number or letter) tells you the model year. This standard applies to vehicles built in or after 1981. Before 1981 the VIN format was not standardized and was different by each car manufacturer. 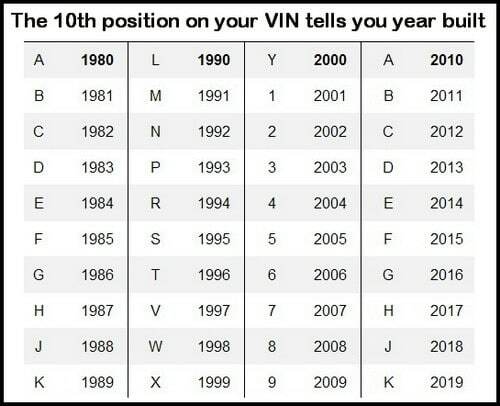 To find your actual vehicle model year, use the table below. LAST 7 POSITIONS OF VIN NUMBER: The VIN positions (number or letter) of the eleventh, twelfth, thirteenth, fourteenth, fifteenth, sixteenth, and seventeenth sections tells you information about the vehicle that VIN is assigned to. These details would be, name of the assembly plant, options on the vehicle, production number, etc. You can type in your VIN number and have it automatically decoded by using the VIN Decoder website. If you are trying to find your original window sticker for your car or truck, it can be printed out and used to sell your car or just keep in your glove box to have the original sticker that came with your car when it was new. If you need a guide to sell your car on Craigslist, you can find great tips on the easiest and fastest way to do so. If you want a way to run a free history report on your vehicle there are many sites that do so and won’t cost you a penny. If you need to fix your cars cloudy headlights before selling your car, there are many different products that can help you do this in a few hours. great site,found my 09 gt500 window sticker but says cant find my 04 gt mustang,any help would be great vin 1fafp45x54f153792 thanks. Next post: Car Tire Numbers Explained – What Do The Numbers Mean?